Konami today announced it’s bringing the highly-regarded Pro Evolution Soccer franchise to mobile devices with a free-to-play game in part based off its MyClub team-building mode. PES 2017 will feature the same game engine found on consoles but optimized for mobile devices and includes all of its partnered club, league, and tournament licenses. ♦Experience the excitement of a realistic match! The new mobile title embraces PES 2017’s iconic gameplay with realistic movements, complex tactical settings, and captivating vocal commentaries. Relish in the authentic sensation of successfully passing, scoring a goal, and the rising tension of a match anytime, anywhere! ♦Master gameplay and movement through optimized controls. Known for its real-to-life gameplay and movements, the PES series has been recreated for mobile, allowing players to deliver passes and shoots with simple yet intuitive controls like tapping and flicking, as well as develop advance techniques such as faint, one-two and through passes. Fans of the original console version can also enjoy the Classic Controls on the virtual pad. 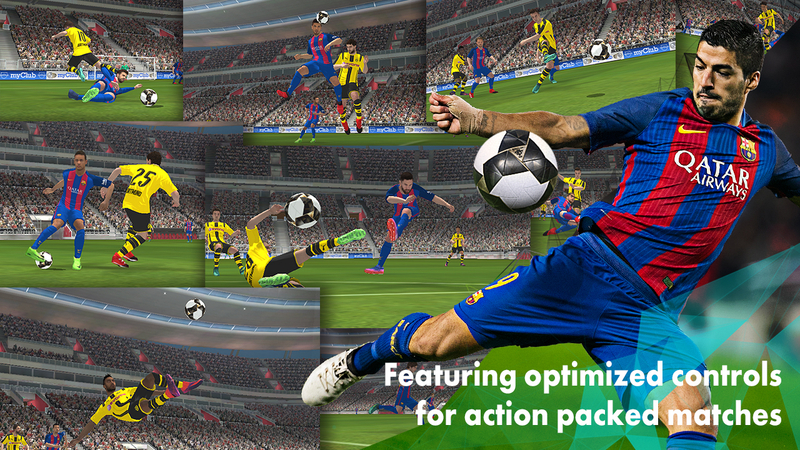 ♦Engage in realistic abilities and characteristics of athletes from partner clubs and leagues across the globe, including favourites such as Messi, Neymar, Suárez, Iniesta and Piqué. ♦Build an all-star team by using special scouts and agents, and train skills to master essential moves and progress to advanced tricks. ♦Compete against opponents from all over the world in Online Match, including friends on Local Match and experience the complete PES excitement! Pre-registering for the game which can be done here for iOS or Android provides bonuses in the form of a super rare, minimum silver status special agent for FC Barcelona, Borussia Dortmund and/or Liverpool FC. It should be no surprise that Konami is attempting to move its soccer franchise into the potentially lucrative mobile space. The company is now largely dependent on free-to-play mobile games and gambling machines so this is a natural move for them. EA Sports has proven there is a market for free-to-play Ultimate Team style mobile offerings with FIFA, Madden, and NBA Live, which draw in tens of millions in digital revenue every year.